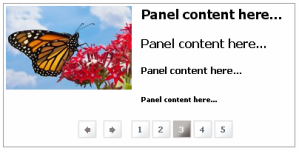 Border around the Show can be set using ob_show_panelsholder class in the style sheet. 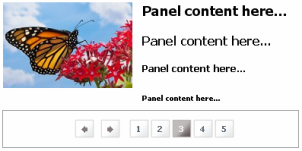 Background color can be set for Show using ob_show_panelsholder class in the style sheet. 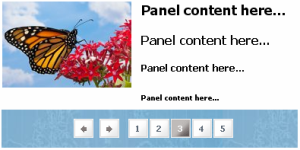 Background image can be set for Show using ob_show_panelsholder class in the style sheet. 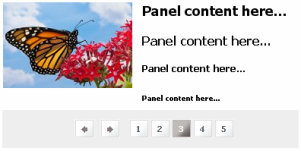 Border around the Show panels can be set using ob_show_panel class in the style sheet. Background color can be set for Show panels using ob_show_panel class in the style sheet. 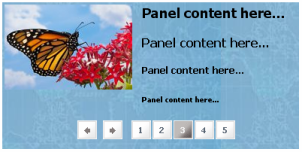 Background image can be set for Show panels using ob_show_panel class in the style sheet. Scrollbars can be set or removed using ob_show_panel class in the style sheet. Border around the Show changer can be set using ob_show_changer class in the style sheet. Background color can be set for Show changer using ob_show_changer class in the style sheet. Background image can be set for Show changer using ob_show_changer class in the style sheet. Arrow images can be customized using ob_show_changerleft, ob_show_changerleft_over, ob_show_changerright, etc. classes in the style sheet. Changer numbers can be customized using ob_show_changernumber, ob_show_changernumber_over, ob_show_changernumber_selected classes in the style sheet.